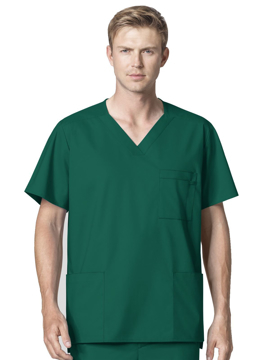 A fashion lab coat that features a notched collar, princess seams and front button closure. Also features two patch angled pockets and two pockets with a pleated detail look. Back yoke, princess seams, and an adjustable back belt with buttons complete this coat. Center back length: 29". 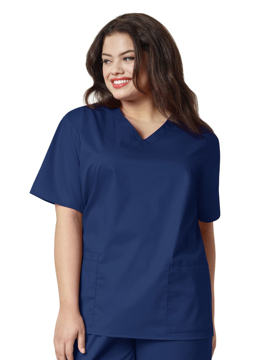 This v-neck top features a right patch pocket with cellphone pocket, left patch pocket with pencil stitch and instrument loop, shirttail hem, and side vents. Center back length: 26". This v-neck top by WonderWORK offers special motion stretch and high thread count fabric for a beautiful drape that moves with you, featuring an updated design that includes a soft line v-neck and tailored silhouette with side vents, this top exceeds traditional industry standards with styling that flatters all sizes at exceptional value. Center back length: 28½". This WonderWORK v-neck top features a modified v-neck and shoulder detail for a sporty, masculine look with longer back length and vented sides for added coverage and three pockets. Center back length: 31".